Facial recognition, intelligent robots, Virtual Reality (VR) navigation and other advanced technologies will be used to ensure safe and convenient trips during the world's largest human migration - China's Spring Festival travel rush, also known as "chunyun," which is to kick off soon. 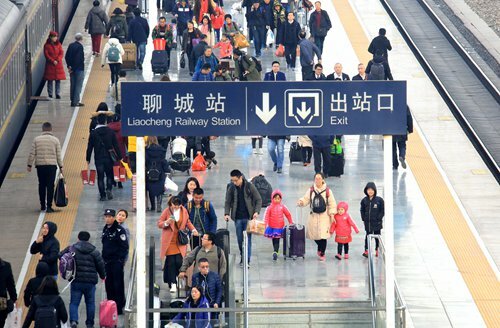 The 2019 Spring Festival travel rush from January 21 to March 1 is expected to see about 2.99 billion trips, up 0.6 percent from the previous year, Lian Weiliang, vice minister of the National Development and Reform Commission (NDRC), said at a Friday press conference. Although the travel rush is yet to begin, many train stations have already installed high-tech gadgets to help passengers. Guangzhou South Railway Station and Shenzhen North Railway Station invited intelligent robots to guide travelers at the maze-like stations. The robots can recognize passengers' voice and answer questions about the train's timeline, ticket information and other queries, an employee surnamed Gong from China Railway Guangzhou Group, told the Global Times on Friday. Gong said that the robots have become popular at the station, with many travelers also asking them to sing and dance in order to entertain themselves during the long wait. Facial recognition for checking tickets is not new to some railway stations. This year, however, the number of stations with the system has increased from 133 to 300 nationwide, Huang Xin, an official with the China Railway Corporation, said at a conference in December 2018. The system only requires travelers to put their tickets and ID cards on the scanner. The waiting time to enter Beijing South Railway Station varies from 10 seconds to 2 seconds per person. Gong said that the Guangzhou South Railway Station has also adopted AI technology to supervise heavily crowded areas. Such spots can be decongested to avoid accidents and fights. China's Civil Aviation Administration, which opened e-ticket service in 229 airports this year, endeavors to push the "paperless" movement and protect the environment, China Central Television reported on Friday. The transportation departments are also trying to provide convenient services to travelers during the journey with the railways going ahead with the "toilet revolution" on trains. During the travel rush in 2019, cleaners will check the toilets at least once an hour and ensure they meet "hotel standards." "Toilets on trains used to be unbearable. But now they are as clean as hotel toilets and smell nice," Wang Gaofeng, a passenger who arrived in Beijing from Taiyuan, capital of North China's Shanxi Province, on Thursday morning, told the Global Times. A total of 4,787 and 4,860 two-way train services will be scheduled daily before and after the festival respectively, up 5.4 percent and 5.2 percent from the same period last year, according to Lian. At the same time, the aviation authority plans to schedule 532,000 flights during the travel rush, an increase of 10 percent year-on-year. To address road safety, Liu Xiaoming, vice minister of transport, said at the Friday briefing that they will investigate hidden dangers and manage road congestion to prevent accidents. The building of social credit system will be further strengthened and violators will be severely punished, said Liu. As for the usual problem of difficulty to buy tickets, Liu said that the railway department is improving its service so that travelers can purchase tickets faster on ticket-booking websites.